Having visited this haunted house before we were looking forward to another visit to see if similar activity occurred. All of my séance sessions were held in the study and the bedroom. We were joined firstly by a spirit called Antony who was in his 40s and from 1850s era. In most sessions Antony was able to move and manipulate people and pull them to the floor as well as move the bedclothes. Those who saw the bedclothes move were genuinely surprised, although it only happened in the first session. Other sessions people were just pushed and moved and had their arms lifted. Although in the third session people were pushed towards the door. In the study we met a spirit called Thomas who at one time lived in the house, around 1890 and a more modern spirit from 1986 who passed away just outside the house as he was involved in a motorcycle crash. Some of the guests who sat in the chair in one corner of the room felt uneasy, whilst others who stood in another corner became more uneasy with time. Many people in all groups felt dizzy or had headaches throughout these sessions which was unexplainable. 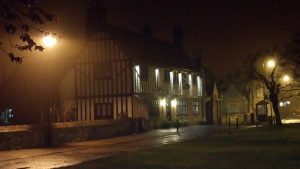 This was an excellent ghost hunt with many people in the free session experimenting with scrying in an upstairs room and getting some amazing personal evidence. Group B – We started with using the dowsing rods & pendulums, and once everyone had established their yes & no’s we asked spirit some questions. Everyone had a male spirit, however possibly not the same one as there were 5 spirits with us. 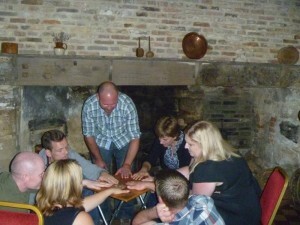 We then moved to the Ouija table to find out some more information. The first spirit that came through took the glass to ‘goodbye’, but almost immediately another spirit joined us. It was a male spirit age 19, from 1594 called Hugh and had worked here, but was murdered here. This spirit stayed with us all evening, having some tremendous fun at the end of the night moving the table all around the room. As two other guests were holding the dowsing rods, I asked spirit to point the rods to where the spirit was standing, and asked spirit to take the glass to the nearest edge of the table to where he was standing, and they both moved/pointed to the same place. We then had a female spirit join us, her name was Jenny, but spelt here surname as Roman, then seemed unsure. She was from 1957, age 18, and again was murdered here. We then had another female spirit, spelling her name as Voz. She was Austrian, age 39 and from the year 1790. She had an affair with the vicar and was pregnant, although had met the vicar in Austria, got pregnant there before coming here. She lived here for 9 days, but was in England for 6 months. She died of a disease but couldn’t establish which one. And although she said she had had a miscarriage, she later said her child had been born alive. One guest felt a tug on the hood of his jumper, turned to me to see where I was standing and was surprised to see I wasn’t that close. Whilst 4 guests were on the Ouija, two other guests were trying table tipping, and the table rocked gently for a while. When the Ouija session finished all 6 guests tried the table tipping, and as we only had 5 minutes left of our session I asked spirit to start moving the table quickly. It did by rocking the table gently at first, and then got quicker, with only the finger tips touching the table once it got stronger. Asking the spirit to walk the table around the room, the table chose not to and promptly rocked the table into the fireplace, which the guests thought was very funny. Group C – Started by showing the guests how to use the dowsing rods & pendulums, and once they knew their yes & no movements they asked questions. Again we had a male spirit with us, and asking spirit to point all the rods to where he was standing, they all pointed to the fireplace. After everyone had been asking spirit various questions we tried the Ouija table, but unfortunately had no movement. We tried table tipping but only had creaking and very slight movement. 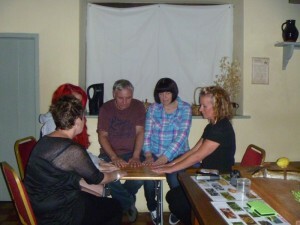 Group A – Again we started with the rods & pendulums, and guests were able to ask the spirits various questions. We had male & female spirits with us. 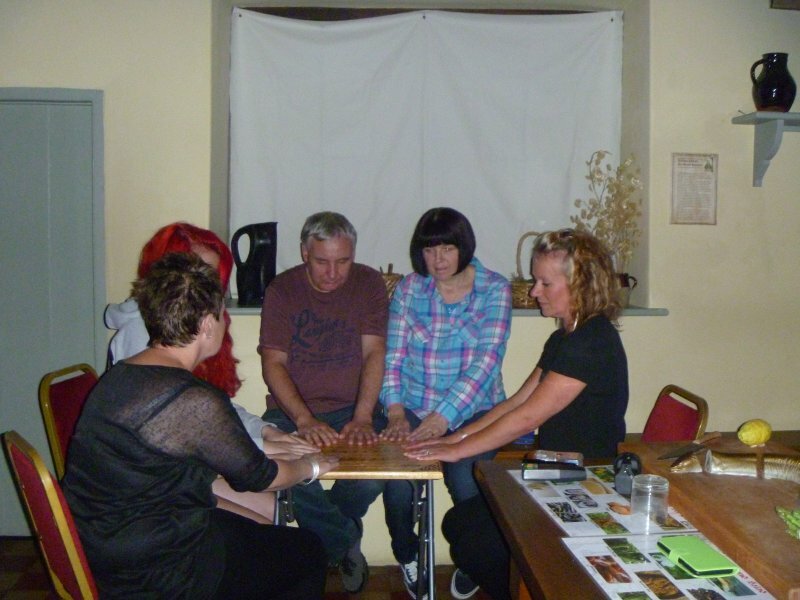 We then started with the Ouija and only had one movement spelling out the word ‘deaed’, not sure if the spirit meant dead. I then suggested the four male guests seated around the Ouija table tried table tipping, whilst myself and the only female guest in that group tried table tipping on the other table. Encouraging spirit girls v boys, which table can be moved first and then the most. Both tables moved the same with rocking, then both stopped at the same time. Meanwhile two guests tried table tipping by themselves and were surprised by the gentle rocking with just them touching it. We then tried all guests around the table and it started rocking quite quickly. As the table was trying to slide, I suggested to spirit we use the Ouija as it slides better on the floor. Asking spirit to lift the table one way to confirm okay to swap, the table lifted to confirm yes. The table then slid all around the room, going slow then fast, twisting as well, and responding to our requests too. Group A – As always, just a little bit excited when going to a venue for the first time, and Oliver Cromwell’s house did not disappoint. Rather than start with the Ouija straight away, I passed around the pendulums and explained how to use them. Everyone was surprised when their pendulums started moving, and once they knew their movement for yes & no, asked the spirits questions. One person had a male spirit, the rest of us had female. We then moved to the Ouija table, and with this being the first time for all the guests, they were thrilled to see the glass moving around. We had the spirit of a boy aged 7, but he didn’t stay too long before he took the glass to goodbye. We waited a couple of minutes before the guests wanted to try again. This time we had a male spirit aged in his 90’s, but not much more movement. However some guests were feeling hot & cold next to them. We did try some table tipping, but only received lots of creaks under the table. Group B – With my second group again we started with dowsing rods & pendulums. Everyone received movement, and started asking spirit questions. With my pendulum the spirit was male from the 1700’s, lived here but didn’t work here, and there were 4 spirits in the room with us. We tried the Ouija table but received no movement on the glass. Some of the guests spent some time in pairs in the larder area. We then moved the table in front of the fireplace and tried some table movement. After a short while the table slid one way (the table had a metal frame, and was easy to move on the ceramic floor). Then it moved again the other way. It then moved so it was touching someone’s foot, and seemed to use this stop and lift up on that corner. I then said the floor is probably too slippery to lift up the other side, and with the spirit not wanting to be outdone, the table started lifting the other side! With all seven guests’ hands on table, and myself observing, we were all amazed how the table moved very easily around the room. Often lifting on one corner and spinning around. Some of the guests were feeling cold spots around them. We also noticed if I turned my torch off, or a guest that was filming on his camera stopped recording, the table would then start moving faster. Before the table started moving, we were hearing knocks/bangs in the room. With the free session I initially joined 3 guests that hadn’t experienced the table tipping earlier, and we were able to see some the table moving. We asked the spirit some questions by asking the table to be moved one way for yes, and the opposite for no. The spirit that was with us, and had been moving the table on the earlier session was female, and was known as the ‘lady in blue’. I then ventured upstairs and with some guests doing some scrying in the mirror, and getting some great results, we went downstairs to the panel room with a Ouija board and glass. We were all sitting on the benches, and could hear movement in the room all around us. Of course being in a room full of wood, you will hear noises, so will be unsure of what we were hearing. However, I did feel someone touching my leg, thinking it was a guest next to me, was surprised when turning on the torch to see he wasn’t near me. We could feel the glass moving slightly on the Ouija board, but seemed to move a little bit more on the bench without the board. The guests then wanted to return to the kitchen to try table tipping again, and once more the table started moving around the room in the same way as before. The first time we visited this venue for a ghost hunt it was an interesting night, although I was unwell at the time and could not do my normal activity on the ghost hunt, I was therefore keen to return to see if this made any difference to the paranormal activity that the guests encountered. The first group we started in the Study, we were joined by a spirit called Timothy aged in his early 20s and had a motorcycle accident in 1984 local to this venue. He was about 6’2″ and dressed in full leathers and I described him as looking like the French cartoon character TinTin (i.e. baby faced). During the séance Timothy first started to lift the guests arms and then he proceeded to push and sway some people, mostly this happened to Diane (guest) as it always took her by surprise which was amusing to watch. Jeff (guest) who usually didn’t get warm, said that he had never felt so warm before. I decided to move into the Bedroom as this was a cooler room as I too was feeling quite warm. In this room we were joined by a more forceful spirit that was able to lift everyone’s arms but in a robotic way, something that I haven’t experienced for a long time. The spirit was called Judge Cartwright and he wore a three piece black suit, he had shiny buckles on his shoes and was aged in his late 50s. He gave me the year as 1780. This particular person wasn’t a nice person, in his eyes everyone was guilty, but he too was corrupt and often took bribes. All he managed to do during the rest of the séance was make Karen & Nicole (guests) feel unwell and not “in the room” and slightly detached from what was going on. The second group séance was in the larger room because the group was quite big. Some of the guests felt their arm moving and swaying, but this only affected half of the circle. One guest felt his stomach and vocal cords tighten and when he spoke he sounded drunk and incoherent and even to the point of being delirious and distant. However after a few minutes this feeling subsided and he returned to his normal self. 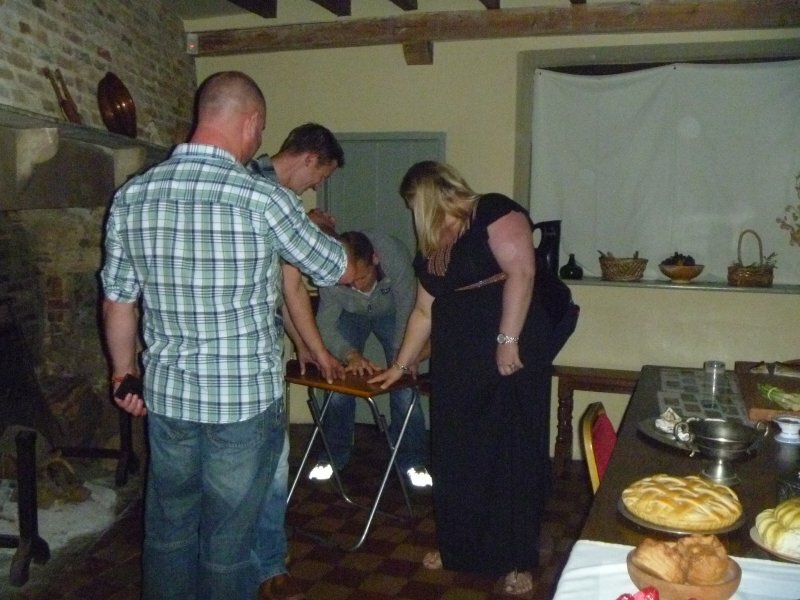 This was an excellent ghost hunt in which all the guests thoroughly enjoyed themselves as did the Ghost Hunt Events team and we will be returning to the venue in 2015.